Apple on Monday announced an expansion to TestFlight that allows up to 10,000 users to beta test apps prior to release on the App Store. Apple revealed the service expansion on its developer webpage, saying app makers can now invite up to 10,000 users to beta test their wares through the first-party platform. The change amounts to a quintupling of active TestFlight testers available to developers, which was limited to 2,000 participants since 2015. 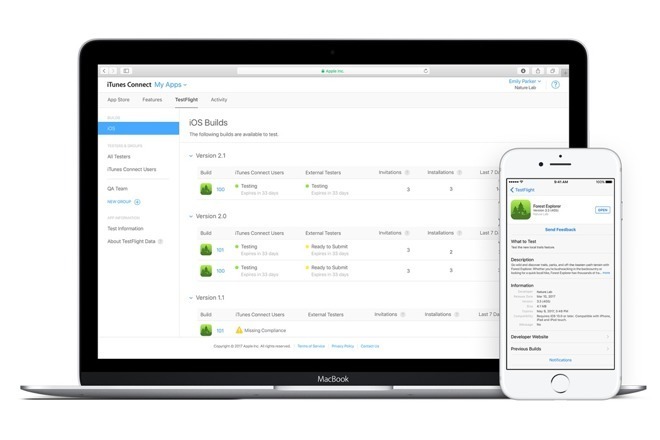 Apple has slowly grown TestFlight since purchasing its developer Burstly in 2014. The first change came months after the acquisition, when Apple expanded TestFlight support to 1,000 users, up from an original 100 devices per app. Most recently, Apple in April quietly extended beta build evaluation periods from 60 days to 90 days. That update also delivered support for multiple app builds, allowing developers to concurrently seed and evaluate different app versions. TestFlight allows app makers to gather valuable user experience feedback prior to releasing their wares on the App Store. Testers are invited to install prerelease apps on iOS, tvOS and watchOS devices by redeeming a special code delivered via email, a user-friendly process that improves upon legacy UDID-based provisioning. Like the App Store, users are alerted to, and can download, new software updates through the standalone TestFlight app. The latest version of the TestFlight app is available as a free download from the App Store.